A hair transplant performed by a robot could be less painful and give a more natural result, claims a US firm. Restoration Robotics has created an automaton that works in a similar way that other robot surgeons do when synchronizing with the movements of a beating heart, and can bestow a full head of hair on a slaphead in around five hours. Restoration Robotics' Frederic Moll, explains how his hair'bot works below. The device plucks individual hairs, follicle and all, from the patient's scalp, using suction through a one-millimeter needle guided by cameras and 3D-imaging software. 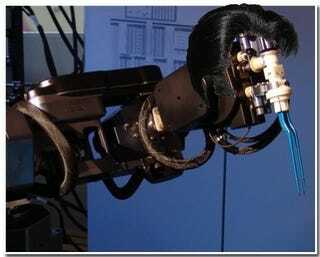 It is mounted on a robotic arm normally used in circuit board manufacturing. The hairs are then implanted back into the patient's scalp.